June 21st. Be sure to go to the Row by Row Experience website to read the rules for participation. We are still waiting for our 2018 fabric plate to arrive! Need a little color in your stash? "Color Cuts" from Moda are a perfect way to add that color. There are 72 prints and 6 color ways that consist of 5" strips, 10" squares and fat quarter rolls. It is an easy way to fill in colors for your stash. We will be making the quilt kit for our 2nd Saturday BOM starting in Sept. The kit includes a mini companion ruler and the cupcake recipe cards for making the triangles. I will break it up into 12 month sections. 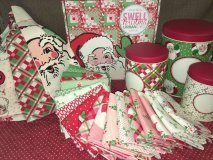 "Swell Christmas" by Urban Chicks for Moda is a charming vintage Christmas line. This is my Santa, the Santa of my childhood with a round face and rosy cheeks and waving at me! I'm not saying I'm vintage though, just Santa! 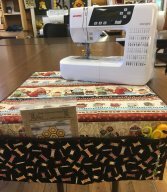 We have the whole line of fabrics, a set of 3 tins, a set of 4 towels packaged for gift giving, and a kit to make a log cabin quilt. The Santa is cut from a panel and appliqued on. He is only available in the kit! Make a mat to go under your sewing machine. Not only does it help protect your table top, it can hold various notions you are always reaching for and it cushions your machine. This is the perfect accessory if you go to classes or retreats with your machine - just grab your machine, mat and go! 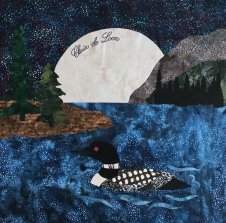 is a great addition to any quilt room! This is an oldie but oh so versatile! Such a great way to use those fabrics you want to feature. It also is a nice setting for 12" orphan blocks. It is also a perfect quilt to introduce to beginner quilters. Celebrate Flag Day with these cute folded stars made with red, white, and blue fabrics. Add a pin backing and you can wear it whenever you are feeling patriotic. 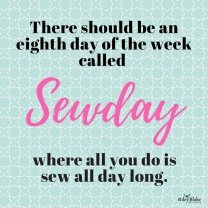 We will provide fabric kits with pin backs included for a super fast make and take!